When I want an absolutely reliable reference measuring tool, I reach for a Starrett. It’s that simple. 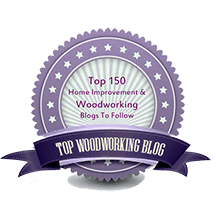 We’ve all had our frustrations with tools that seemed promising when new but proved to be deficient in design or construction and thus do not perform. I particularly avoid tools that are unnecessarily complicated or are merely solutions chasing a problem. Worst of all are tools that are made just to be pretty. On the other hand, don’t get me wrong, there are some great small-scale toolmakers out there making high quality, useful, and often innovative products. Reliable primary references for straight and square are necessities in the shop – specifically, a straightedge at least 24″ long and a combination square (a large machinist square is a more expensive and less versatile alternative). Don’t skimp on quality for these; they are lifetime tools. Get Starretts and be done with it. (A flat reference, such as a granite surface plate, though not a must, is also helpful and can be had economically.) My Starrett tools include a 24″ straightedge, a combination square with a hardened head and 12″ and 18″ blades, a 6″ adjustable square, and several others that would be considered more optional than basic. The integrity of most shop procedures and tools can be traced to verifications using these reference tools. Examples are a flat jointer table with a square fence, the soles of handplanes, a table saw crosscut jig, shop-made jigs, and so forth. Things such as these allow you to start a project on a reliable basis rather than dealing with fundamental inaccuracies that will be carried like an infection through the building process. 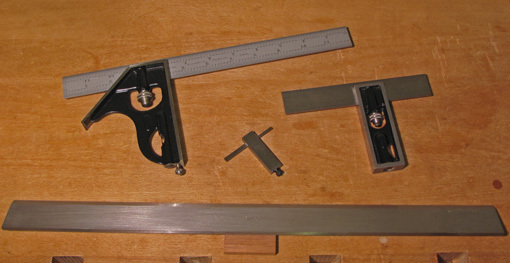 Top grade straight and square reference tools are like the Constitution of your shop and you’re the Supreme Court. Starrett is a solid American company with a proud history, and is technologically current and innovative. They continue to manufacture most of their precision tools at their Athol, Massachusetts plant, working to unsurpassed tolerances. Every one of their measuring tools that I own or have seen has been exquisitely well finished. A Starrett is a mensch at the bench. At Woodshop Specialties (http://www.woodshopspecialties.org/) in Rutland, Vermont, there is a 6′ Starrett straightedge hanging in a prominent location. Whew, that’s about $400-500 of judge. But I’d call it the Law, the user is the judge, haha. It is great to have the go to brands and tools… Something about a name brand that can be so comforting. I agree. I guess it comes down to the people behind the name.